Please select your colors below. If you want to customize your bags a little bit, then these are for you. 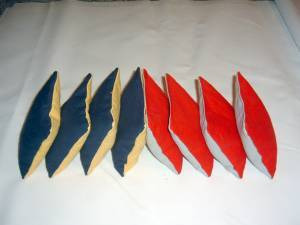 Instead of solid colored bags of 4, have different colors on each side. For instance, if you're a chicago cubs fan and your spouse is a chicago white sox fan, pick a set that's royal blue/red for one set of 4 and white/black for another set. Ships within 48 hours. I ordered the dual color bags late on a Monday night and had the bags at my door on thursday. Thanks for the quick shipping. The only negative I have is that I never recieved a shipping confirmation so I was surprised to see the bags arrive only 2 days later. The quality of these bags is superb, I will definitely be purchasing a set from this site in the future, maybe a stick and slick set. Bags are alll evenly weighted, took a few rounds to start breaking them in. I have a couple of different sets of bags but everyone reaches for these, thanks for such a great durable product!